The office of Dr. Roy Gonzalez, Jr.
At the office of Dr. Roy Gonzalez in San Antonio, we provide families with an individualized orthodontic treatment plan to ensure that they have a beautiful smile and great oral health. With early orthodontic treatment, we help your kids with the foundation that they need to have a healthy smile that will last for years to come. It is recommended by the American Association of Orthodontists that you schedule an appointment for an initial orthodontic screening by the time your kids are around the age of 7. Ensure that your children are receiving the professional treatment they deserve by booking an appointment with Dr. Roy Gonzalez. Why Should My Child See a Family Orthodontist? Taking your children in for an initial orthodontic screening when they are young will give us an advantage when planning the ideal development of their smile. It’s important to note that this first examination does not necessarily always call for immediate treatment. This stage is more focused on gaining a clear understanding of how your child’s smile is developing and what risks they can be facing in the future. Once Dr. Gonzalez identifies those risk factors, he can begin creating a personalized orthodontic treatment plan for the coming years that can fix existing issues or prevent other conditions that may arise. 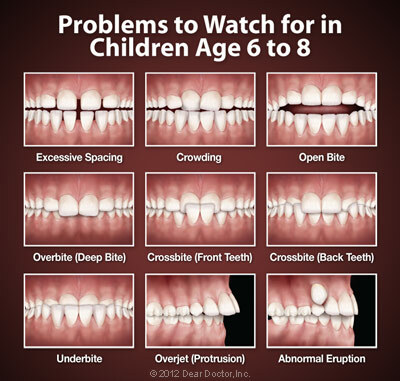 We recommend that you schedule your child’s first orthodontic appointment by the age of 7 because most children’s first adult molars come into the mouth around age 6. In addition to their adult teeth coming in, there are many other developmental markers that begin to show themselves during this time of rapid growth and change. Identifying these markers are essential in providing effective, preventive orthodontic treatment. This condition takes place when the upper teeth rests behind the lower teeth when biting down. To fix cases of crossbite, we use an appliance called a palatal expander, which gradually and painlessly widens the upper jaw. If the problem is left untreated, it may require more extensive treatment, possibly oral surgery, to correct it. Crowding happens when there is not enough room in the mouth for all of the permanent teeth to fit comfortably, which results in teeth developing at various angles and a smile that does not align. Using a palatal expander or performing a tooth extraction are common treatments that can help the adult teeth erupt properly. Even if braces are required later, the treatment time may be shorter and less complicated. Underbite occurs when the lower front teeth are in front of top front teeth. An overbite is when the top teeth overlap the bottom teeth, sometimes to the point you cannot see the bottom teeth. This type of bite issue can be dangerous, since the teeth exposed in the front can be more prone to chipping and fractures. The cause of these bite issues are due to over development of the upper or lower jaw, which can be corrected by using braces and other appliances. If the problems are left untreated, surgery may be required later on. The sucking reflex is natural in early childhood as thumb-sucking has a calming effect for infants. 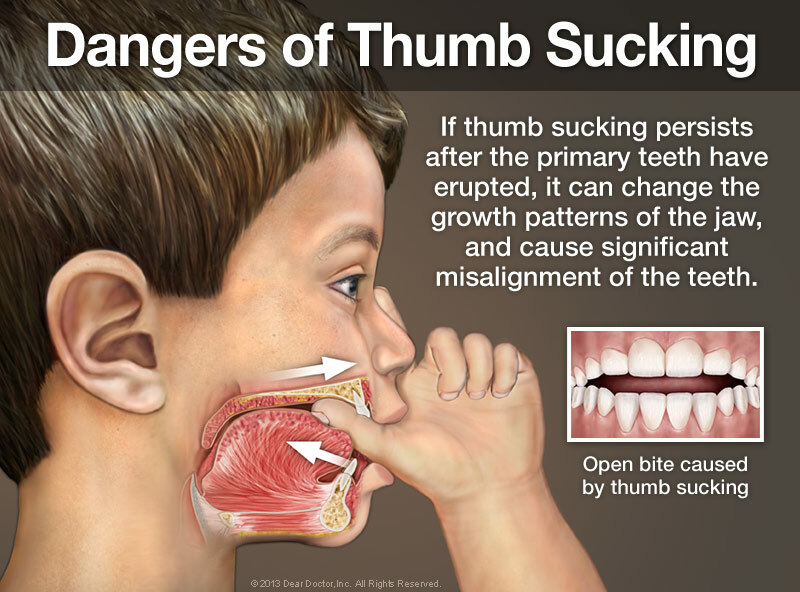 The reflex usually disappears between ages two and four, however if the habit persists much longer, it can lead to more serious bite issues. 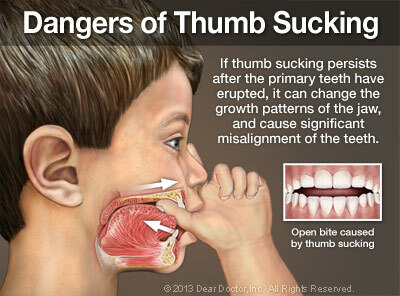 When sucking on a finger, pressure is applied to the front teeth and upper jaw, which can cause the teeth to move apart and the jaw to change shape. This can lead to the orthodontic problem called “open bite,” and could impair speech. An open bite can also be caused by the force of the tongue pushing forward against the teeth (tongue thrusting). This is an abnormal breathing pattern that children can develop in which the mouth always remains open, passing air directly to the lungs. Children can acquire this habit due to difficulties breathing, such as having a blocked airway, and turn to mouth breathing as a solution to breathe more easily. The consistent habit of mouth breathing can lead to alterations in the tongue and face, including abnormal upper and lower jaw growth that can lead to serious orthodontic problems. Orthodontic treatment can be used to prevent or break these habits and in turn help reduce the chances of developing serious bite issues. The effects of certain habits may be difficult to notice, but taking your child to their San Antonio orthodontist, Dr. Gonzalez, for early orthodontic treatment, will help identify problems right away and allow time to create a treatment plan to ensure your child has a healthy smile. Schedule an Appointment With Your San Antonio Orthodontist! If you would like to learn more about early orthodontic treatment, or schedule an appointment for your child’s first evaluation, contact us by phone at (210) 344-9295 or through our request an appointment online. Lead by Dr. Gonzalez, our family orthodontic practice has one goal - ensuring the health and beauty of your child’s smile. We can’t wait to meet them!